February | 2014 | Chubby For Life? Played poker until 3am. It was -1°F with winds whipping around. It felt like acid hitting any exposed skin. I find it hard to believe that I used to work outside in this kind of weather. The road conditions don’t looks so good this morning. There was also a lot of blowing snow yesterday. With the temperatures as low as they are, I’m not sure if the roads will be clear by Saturday morning. I noticed that some intersections are really messy. In the interest of safety I think the ride should be cancelled. What are your thoughts? Ha. Looking grim for tomorrow. Worst case scenario, I go to the group, we have some chili and I meet some nice people. We’ll see. 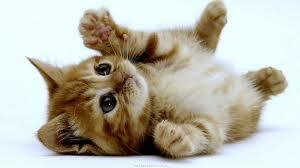 Now, here is a random picture of a kitten for no particular reason. I got up this morning to find another layer of fresh snow. 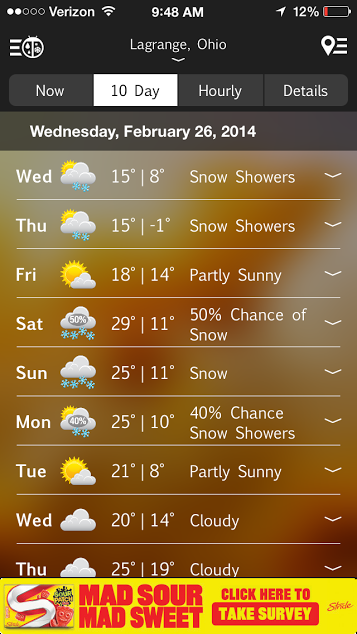 It’s currently 10ºF and look what the next ten days look like! At least Saturday has upgraded to 29 degrees. Just to show how messed up Ohio is; Two years ago my brother Terry was dying. It was the first week of January and I took him to my favorite beach on the south shore of Lake Erie. It was 70ºF. It was a beautiful day with the sun shining and the breeze was cool blowing off the cold water of Lake Erie. Can you tell I can’t wait for Spring? I took my daughter out to eat and on the way home we ran into another snowstorm. I am tired of winter. 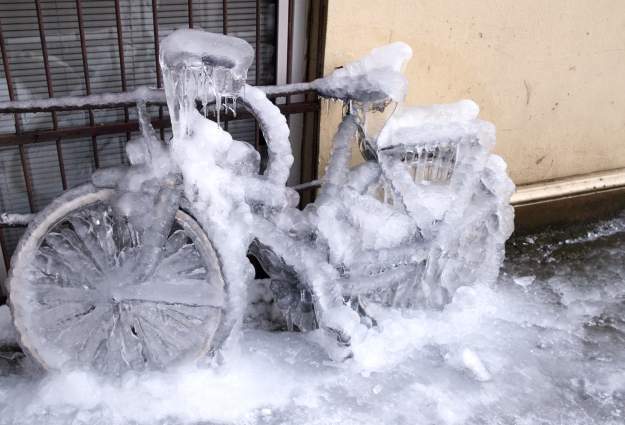 I have friends in the south sending me photos of rides in warmth and sunshine. They are my friends and they are bastards. My weight is steadily dropping and I am sure that this year will be the year that I achieve my ideal weight. As I eat better I am much more aware of the food choices around me. I can see why I was beyond chubby. 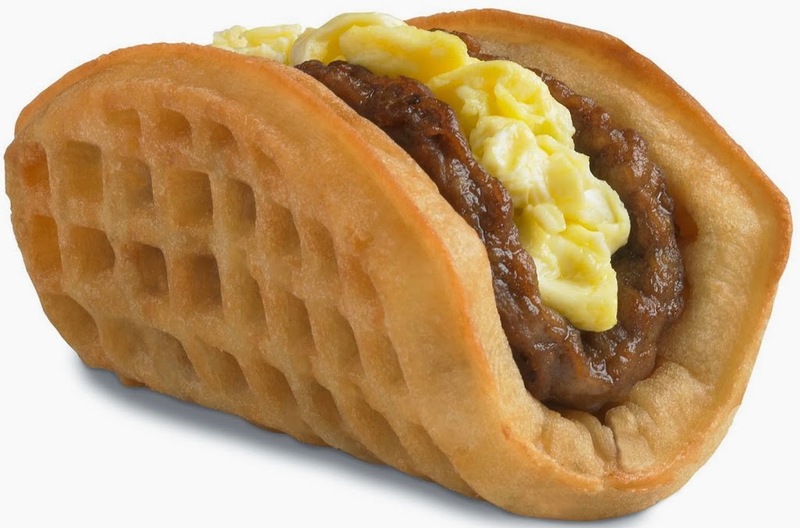 The other day Taco Bell announced a breakfast taco coming out this month. Take a look at this picture and you can see why Americans are losing the battle. The weather app on my phone has changed daily on the temperature for this Saturday’s Chili Weiner Ride. 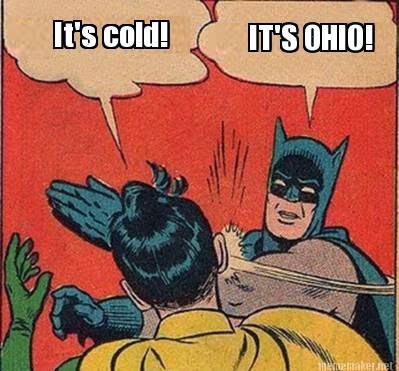 Yesterday it said 18ºF and now it says 23ºF. I have tights and a thermal jersey so I’ll probably give it a go. I don’t expect to do any real miles but I’ll be on the bike. I am excited and soon I will share my big plan for this year. We had a big snow a couple days ago. It put a foot on the ground, just as cycling season is about to start. I’ve been keeping busy. I play guitar, banjo, ukulele and dulcimer. Plus I’m a serious chessplayer so I’m always doing that. Couple weeks ago a fellow musician who is deaf was having BAHA implants turned on at John Hopkins in Baltimore. I few of his friends decided to make the eight hour drive to play a song or two when he could hear us. On the way there I stopped in West Virginia to pick up one of the guys. I stayed the night and we visited a couple of musicians and I recorded them doing a couple songs. Here is one I recorded and edited on my iPhone. Life is good. Soon the snow will melt. 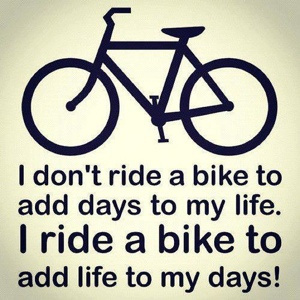 I will be on the bike and this blog will become much more active.